My summer is coming to an end and planning for our first class get-together has begun! Meet the Teacher is one of the most exciting and anticipated days of the school year! I absolutely love getting to finally see all my sweet new kiddos and their amazing parents! When I am preparing for the big day, I really want to make sure that parents feel that I have made a connection with them. The start of the relationship that will support our students begins as soon as they walk in the door and that is so critical to a fabulous school year. Along with the introduction, conversations and mingling that occurs, I want my student's parents to know that they have access to me. That I am really there for them and that they can ask me anything at all whenever the question arises. The easiest and best way that I have found to get my information to them is using QR Codes. QR Codes are awesome in lessons and also work like a charm for Meet the Teacher! There are several websites that you can use to create the QR Codes. My favorite is QRStuff.com because it is so easy to use and always creates a clear, readable QR codes. It is as simple as one, two and three. Now for Meet the Teacher, I like to doll things up and make them look super cute! So what do you think? 2. Your school phone number and ext. The best part....once you have made them, you can laminate them and keep them for next year! Sweet! Speaking of Meet the Teacher, have heard about what we have planned for you next week? Make sure to join us for our very own Meet the Teacher Week! Get to know our fun little bunch and let us get to know you! 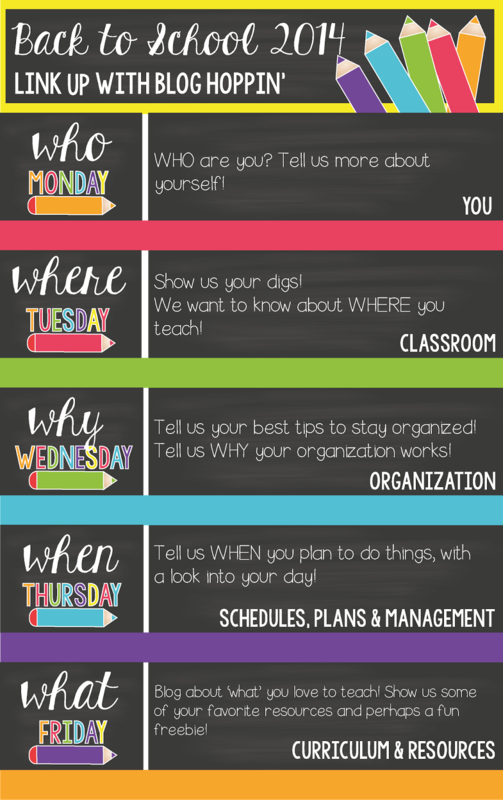 Check each day next week for a fabulous host and a chance to link up and share! Lynda, Do you have a separate QR Code for each thing - a separate code for your email and Twitter account, etc. ?